Outland & Medivh, many Warmane players seem to be biased about this. No one is doing Arena or Battlegrounds on Medivh because they don't fire. There just isn't enough people on at any one time queuing for battlegrounds that ever results in a reasonable length battleground queue timer. Therefore, no one queue's because you'll be in there all day for a WsG with 5 people on both teams. So let's see where the advantages of both are. Outland is a progressive TBC realm with x5 rates and spell costs reduced to 20%. Currently, these raids are available: Karazhan, Gruul’s Lair, Magtheridon’s Lair, Serpentshrine Cavern, and Tempest Keep. ● Cheaper training etc. (70% cheaper). ● 5x exp, meaning getting to end content fast.In game item shop for real money. ● High in population (15k, though queue sometimes nearly 3 or 4 hours). That Outland is a higher times rate server and as a result gear is easier to get, PvP is more active and you don't want a bunch of non-geared Medivh "scrubs" joining your battlegrounds and diluting your experience. Neither do people on Medivh want to join a battleground which is full of well-geared people and get wrecked. This being said there are benefits. In summary, it has a more private (custom) server feeling. A very fun and easy server. ⒈ There will be more people queuing for battlegrounds and arena which means they will fire faster. ⒉ That Medivh players get the opportunity to play PvP, get PvP gear and actually do something other than raiding. ⒊ After a certain amount of time things will balance out and there won't be a massive gear disparity. ⒋ Medivh will gain a PvP community and gain more players because of this. ⒌ 1x everything. meaning slow, but true leveling experience. 5k players, but rising daily. No queue time. In summary, a more authentic TBC experience with a nostalgic feeling to it. You forget it's not retailtbc. That said, way more time-consuming. Finally, choose one that you like the most, the best for you. 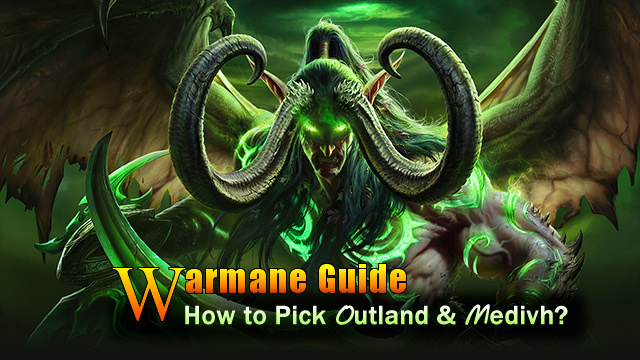 If you play Warmane have fun, don't forget to see what it's like, then you can go Outland! Besides, you can choose Medivh if you play the Burning Crusade.